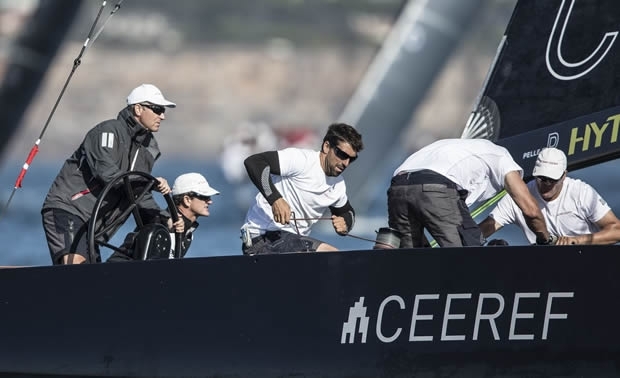 RC44s are not supposed to race at night, but after a windless, race-free opening day at the RC44 Cascais World Championship and a windless morning today, Principal Race Officer Peter Reggio was not going to miss an opportunity. The sea breeze finally came good mid-afternoon allowing a first start at 1530, but this resulted in a general recall and a black flag second start that got away cleanly. After all this and the three solid races that followed, the sun was getting low in the sky. Open to the Atlantic, Cascais has the reputation of being a windy venue, but thanks to a giant area of high pressure hovering over Europe, the gradient breeze has all but shut down off the Portugese coast. Thankfully unlike yesterday, a sea breeze was able to develop today and the teams were at last able to get their first World Championship points. While today was sailable in 6-10 knots, the northwesterly breeze blowing along the coast was decidedly patchy. This, combined with a powerful tide thanks to the full moon having just passed, resulted in a day when consistency was vital and the tacticians had to earn their keep. Doing this best was Igor Lah and Team CEEREF, which posted a 2-1-5 today, leaving the Slovenian team three points clear of defending World Champion, Vladimir Liubomirov's Bronenosec Sailing Team. "It was really nice," said Lah, the 2013 RC44 World Champion. "We know we are in good form, but this result shows it. We made no mistakes - we just wanted to be clear of everybody and sail our own race. The team was brilliant." "Igor did a fantastic job of driving the boat today and the guys kept him fast, both upwind and downwind," said Team CEEREF's British tactician Adrian Stead, adding that their consistency today came about through sheer process: "We kept doing what we've been working at for the last two regattas. We are pleased with our speed, pleased with our boat handling and our goal was to be precise in as many races as we could. "We had a good first race, a very good second race and the third was about digging our way out of a poor start, when we managed to turn an eighth into a fifth." And this was despite nearly coming to blows with Artemis Racing at the weather mark when the Swedish boat snagged the mark and then got caught in irons. According to Stead a lot of today's trickiness on the race course came through the powerful tide turning half way through racing. "There were quite a lot of current swirls and you had to keep looking to see what was actually happening. Typically the right is strong [for the wind] but today you had to be very open-minded." Many of the top teams endured poor finishes today, Team Aqua with past RC44 campaigner Patrick de Barros at the helm in Chris Bake's absence, suffering two, which may prove too much from which to recover. John Bassadone's Peninsula Petroleum Sailing Team, the 2012 World Champion, claimed today's first race, but had to fight back after getting caught in irons and being last off the start line in race two. She too has a stand-in helmsman in Antonio Sodo Migliori, a two time Farr 40 World Champion. "It was a little up and down," admitted tactician Vasco Vascotto. "It was the first day for Antonio driving the RC44 and it was tough." In the first race Peninsula Petroleum won after claiming the pin, but in the second she got squeezed out after a fight with Team Nika left her parked, head to wind. "We didn't accelerate in the proper way - it was a nightmare," recalled Vascotto. "Then, in the last race I made a bad call at the start. I knew the right was strong, but our instruments were showing 10 degree pin end bias. I think I didn't make the right calculation. But we are happy, we are still in there." With Team CEEREF claiming race two, it was the turn of Vladimir Proshikin's Team Nika, the current RC44 Championship Tour leader, to win. However this was after a disappointing 11th place in race one. "I had such a bad start, and actually we made a couple of mistakes. Everything went wrong," recounted Proshikin. "Then in the second race we had a perfect start, unfortunately we came just fourth. In the last race everything went right – a good start at the committee boat and it was just a bit better - smooth movement, we stayed right, laylines were taken very nicely. It all worked." Tomorrow looks set to have the most sailable breeze of the regatta with the first warning signal once again scheduled for midday.